A new report by real estate listings site Trulia confirms what the pet-loving people of San Francisco have likely known for a while now: the city is one of the most pet-friendly places to live. Specifically, Trulia has named San Francisco as No. 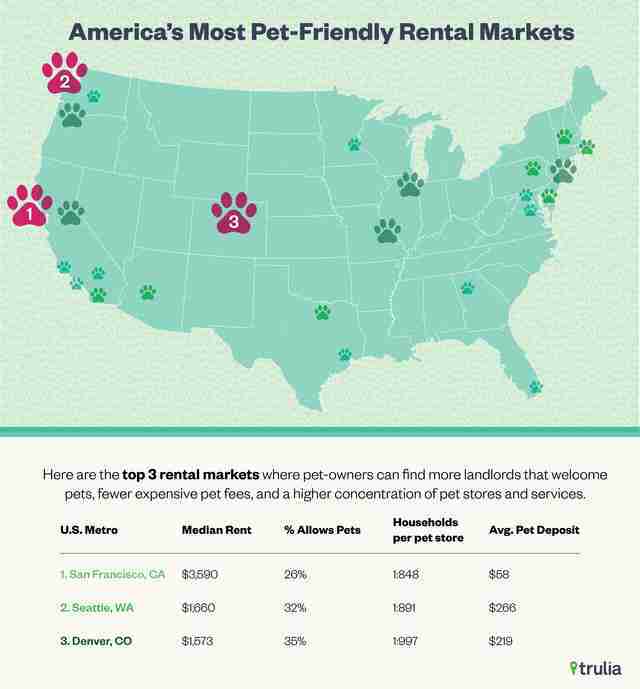 1 in its ranking of the 25 most pet-friendly rental markets in the country due to the city's plentiful pet-friendly landlords, low pet fees at apartments, and high concentrations of pet stores and pet services. Now if San Francisco landlords would only lower their rent fees for humans. Additionally, Trulia found that while SF is the most pet-friendly of the 25 markets, San Diego actually has the highest concentration of pet services and stores and Dallas has the most rental listings saying they allow pets. Meanwhile, Washington D.C., which ranks second to last on the list, is the most expensive rental market for pets thanks to high pet fees, deposits, and pet rents, according to the report. Another interesting finding from the report is that nationally, landlords apparently prefer cats over dogs, with 20% of rentals allowing cats, 18% allowing small dogs, and only 4% of listings saying big dogs are allowed. 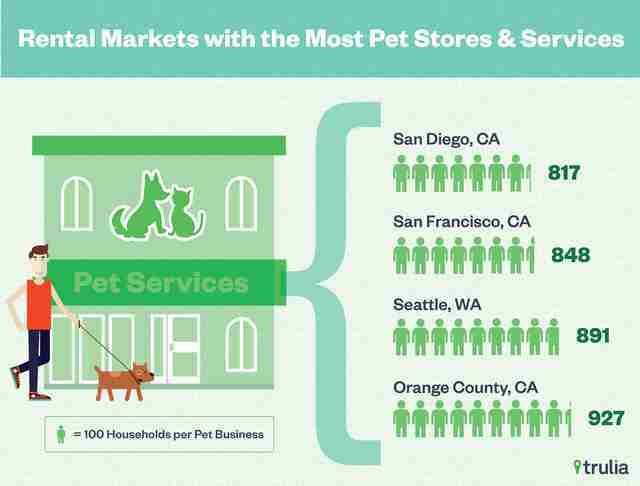 Overall, the West Coast was found to have an abundance of pet stores and pet services -- nine of the top 10 metro rental markets with the highest amounts of these services are in four West Coast states, California, Washington, Oregon, or Arizona (which is kind of the West Coast, we guess), according to Trulia. For example, San Diego has one pet business for every 817 households. Tony Merevick is Cities News Editor at Thrillist and can't wait to someday have a dog in NYC, but is not looking forward to finding an apartment that allows dogs... Send news tips to news@thrillist.com and follow him on Twitter @tonymerevick.